Property Plus was formed specifically for the Slough area, where we see current and future growth in the letting and sales market. We aim to cater for the often specific needs of Landlords and Sellers alike, providing in-house solutions for everything from Property Management to Financial Services. We also seek to provide the best service to Tenants and Buyers too, finding homes that are suitable for every individual and their specific needs. We are based in the busy Tesco Extra superstore in central Slough, achieving a footfall of over 77,000 people a week, meaning we are in a very effective location. This comes with the benefit of Tesco's large covered parking facilities, meaning a secure environment to park when visiting. Come and visit us today to see what we can do for you. We're here to help! We are an independent agent, focused on providing the best service for you as a Vendor, Landlord or Tenant, both by competitive rates and by friendly, genuine and personalised customer service, and we expect you to feel treated as such by our Staff. We are also affiliated with internationally recognised and operating companies operating in various types of property and financial services worldwide. We are based in the very heart of Slough inside the busy Tesco Extra superstore (the second largest in Europe), which sees a footfall of over 77,000 a week. This also provides a sheltered and secure parking facility, as well as the chance to do some shopping when visiting us! We cover all of Slough and the surroundings areas, including: Central Slough, Cippenham, Langley, Windsor, Stoke Poges, Wexham, Burnham and even beyond! You will find our fees to be of a pleasantly surprising value compared to our competitors, especially when you consider the quality of the service we provide too. We will also tailor our Landlord services and packages to you, whether that be to add something you'd like but isn't in a standard package, or to remove a particular service that you don't need to negotiate the commission costs. Visit our Landlords page on our website for a full breakdown of fees and services for Property Management. 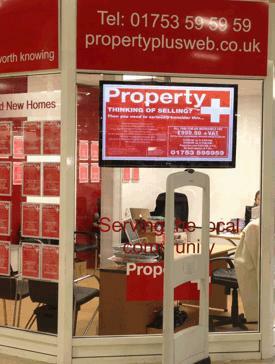 If you are a Tenant or Vendor, get in touch via phone or email for further information.